Police shootings: What happens when an officer fires his gun while on duty? What Happens When a Police Officer Fires His Gun While on Duty? 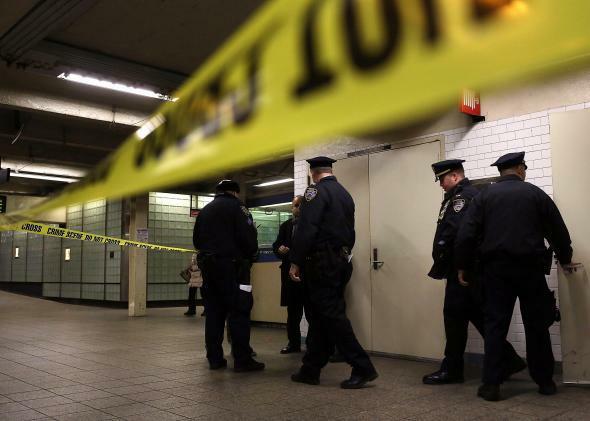 Police stand guard in a subway station in 2013 in New York City. The officer notifies his supervisor of the firearms discharge. The supervisor responds to the scene. Other officers take over any involvement the officer who did the shooting may have had with the incident at hand. The supervisor takes the officer’s firearm from him. In some cases, the supervisor will just trade firearms (assuming he is carrying the same type), so that the officer will not be in public while unarmed. On reaching the station, the officer will return the supervisor’s firearm to him. The involved officer’s firearm will be sent to the crime lab to be examined for proper function and as to what kind of ammunition (authorized or otherwise) was loaded and used. The officer is taken to a hospital or some other facility where blood is drawn for toxicology testing. If he has been injured, he is examined by a physician and treated accordingly. The officer may or may not be interviewed or asked to make or write a statement about what happened for purposes of an internal policy investigation. If a statement is not made immediately, an interview may be scheduled in 48-72 hours. The officer cannot refuse to be interviewed. If he does, he can be charged with insubordination and his employment terminated. When the officer is interviewed, he is usually accompanied by legal counsel or a representative from the police officers’ association or union. The officer is put on administrative leave. He continues to be paid but does not report to work as usual. He may be required to be at his home or otherwise available to respond to the station during set hours (8 a.m. to 5 p.m.). His department may seize his police credentials and/or his department-owned firearms. He may be directed not to take any police action or otherwise represent himself as a police officer. This is uncommon, but it happens. Investigators determine whether the officer needs to be interviewed pursuant to a criminal investigation. The investigations are separate, as the officer enjoys the same constitutional protections against self-incrimination in a criminal investigation as anyone else would. The officer can decline to be interviewed, if he likes. Few officers decline to be interviewed, although they are usually accompanied by legal counsel. When the internal investigation is complete (this can take anywhere from a few days to months), the officer is required to appear before a “shooting board” to discuss the investigation, clarify any details, and identify any relevant police or training issues for future use. The officer is usually notified whether the shooting has been determined to be within policy or out of policy. If it is out of policy, the officer may be disciplined or his employment terminated. If the shooting is within policy, he may then have his firearm returned to him and any expended ammunition replaced. The officer is often required to be examined by a psychiatrist or psychologist to determine if he is fit to return to duty. In some cases, he may remain on administrative leave until he is cleared. He may also be restored to limited or modified duty status, where he works in administrative assignments and may be forbidden to carry a firearm. When the officer has been cleared to return to duty, he resumes his regular assignment unless there is some compelling reason to assign him elsewhere. His agency and many of his co-workers may forget that he has been involved in a shooting. The officer will never forget. Police Procedures: What are the downsides of requiring police to wear body cameras? Police and Law Enforcement: Can I fight off a police dog?